At least one person thinks I’m a decent photographer. Last night, an email popped up on my phone that looked like another man notifying me that I’d inherited 10 million Nigerian nairas. So I went back to work, and ignored it for a few hours. But later, when I checked the rest of my emails I realized it was from someone congratulating me on making Complex Magazine’s “The 50 Greatest Street Photographers Right Now”. It was a nice surprise, and seeing that I’ve been laying low for a while and not paying much attention to the photography world it was very unexpected. And I really can’t believe the writer called me “…a bit of a folk hero in the street photography world.” Haven’t heard that one before, especially since my photography has caused other people to call me things much worse than that. So it was a nice use of words. I’m really appreciative being a part of this group of people. It’s motivating and helps you can keep going when you feel like putting the camera down for good. 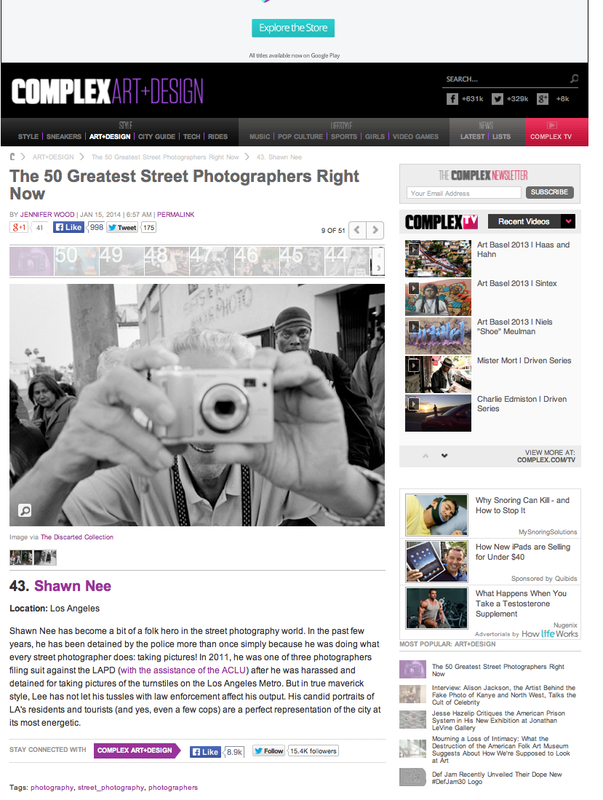 So if you have some free time, go check out Complex Magazine because there’s some great photographers on that list. to choose a natural alternative to cleansing. be used in conjunction with exercise and a healthy diet.